After it's inception with Iron Man in 2008, the Marvel Cinematic Universe maintained a steady quality standard that reached it's peak with the fantastic Avengers in 2012. Then, with the release of Iron Man 3 and Thor: The Dark World, the series went from good to bad in a steep and sudden transition. Following this, in a huge turnaround, 2014 saw the release of the excellent Captain America: The Winter Soldier and the equally amazing Guardians of the Galaxy. Now, after even more buildup, the long awaited Avengers sequel has arrived. A pattern has been initiated: good to bad, bad to good - and now, sadly, a return to bad. 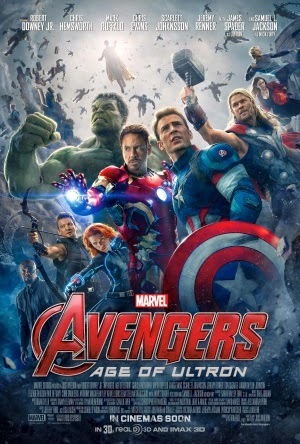 The eponymous superhero squad team up once again to acquire the scepter of their former foe Loki, which is believed by Tony Stark (Robert Downey, Jr.) to house the key to unlock Ultron (James Spader), an artificial intelligence that can bolster their path to achieve world peace. However, things take a turn for the worse when Ultron awakes in a distressed and confused state, morphing him into an angry tyrant hellbent on destroying humanity to cleanse it of sin - leaving the Avengers to remedy their mistake and put an end to his evil plans. The tense trailers made me think Ultron was going to be a terrifying villain that would bring the Avengers to their knees. He wouldn't make jokes or be silly like Loki or the fake Mandarin - he would have a dark, disturbing sense of humour in brief spurts, but all in all would be a merciless foe eager to pursue his goals no matter what. Of course, this is not the case. He is silly, weak, and repeatedly used as the source of many slapstick gags and 'witty' one liners. Yet again, the potential for an amazing villain is wasted on endless stupidity. To add to this, his motivations are barely explored, and so a consequential lack of development makes him incredibly bland and generic. Such light heartedness worked in Guardians of the Galaxy as it developed within a suitable context, but with Age of Ultron, Joss Whedon simply cannot balance any serious elements of the plot with his lust for humour. Not every superhero film has to be gritty and dark, but at the same time, it doesn't hurt to put joking aside for a few minutes and at least try and be sensible. Whenever a scene appears to get serious, a misplaced gag arises and ruins it. Whedon fails to conjure any decent moments of genuine drama, instead preferring to overexploit the notion of 'fun blockbuster' conventions. Even if he tried his best to be serious, the canvas is still far too crowded with tons of underdeveloped plot lines, which pop up at random moments and are sometimes flat out abandoned for no logical reason. You're never sure which character the movie wants to focus on; as an ensemble piece, it surely focuses on them all? Well, if that was the idea, then it failed quite miserably; because characters tend to leave and reenter the narrative at sporadic moments, further damaging the movie's general structure. To compliment this underwritten chaos, in many occasions, character development established in the previous standalone films for Stark, Thor, and Rogers is completely and blatantly shunned. Now I'm all for action within a superhero movie; that's a must have convention. But when you favour endless noisy action scenes over developing a genuine, constructive story, then it's not good whatsoever. The action scenes provide many thrills, but even they turn silly when the stakes appear to rise. Literally, the final moments of the film end up being nothing but smashing, punching, shouting, and a mishmash of cheesy one liners. It's tiring, repetitive, and ungodly irritating. To it's credit, Age of Ultron still has some superb special effects, particularly when it comes to Ultron himself. Despite his awful characterisation, Ultron's portrayal by James Spader through motion capture really injects a masterful level of humanity and realism into his robotic body. He moves and talks exactly like a human being, displaying some impressive animation and hard work from the visual effects team. The performances across the board are generally good, but the script is just too weak for the actors to truly flourish. These minor positives aren't enough to change my general opinion: Age of Ultron is one of the biggest disappointments of all time and, by extension, one of the worst superhero films I've ever seen.